A Scots MP has urged the UK government to investigate the insolvency industry amid claims administrators are cashing in at the expense of creditors. The SNP's Mike Weir is concerned that in many cases the process is taking years, short-changing those who have lost money when a company goes bust. 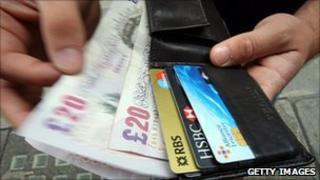 He said the case of Christmas savings firm Farepak showed creditors could get little while administrators profit. The Department for Business said it was examining an OFT report on insolvency. Mr Weir, the SNP's business and enterprise spokesman, said parliamentary questions had revealed that 16,554 firms went into liquidation over the past four quarters, owing an average of £584,000 each - more than three-times as much as in 2006/07. He highlighted the likely Farepak settlement where creditors would get only a fraction of the money they had placed into the saving scheme. Farepak went bust owing £37m to more than 119,000 savers. Mr Weir said administrators and their legal advisers could earn up to £3m. He said there were similar problems with settlements after the collapse of Zavvi and Land of Leather. "The insolvency industry appears to be raking in a fortune at the expense of creditors," he said. "After four years, Farepak victims have been left with pennies while the administrators have walked away with millions, and this by no means is an isolated case." Liquidations also have no statutory time limit and can sometimes take decades to settle. Mr Weir added: "People are actually dying before the insolvency gravy train comes to a halt. Part of the problem seems to be that the industry is largely self-regulated. "What's more, there is no independent complaints investigation procedure or ombudsman to adjudicate on malpractice - there are no questions over fees or delays. "Just like (regulation of) the banks, current UK insolvency regulation has failed." A spokesman for the UK Department for Business said Mr Weir's criticisms echoed a recent report by the Office of Fair Trading which found that self-regulation had failed and that high fees and lengthy timescales were harming the interests of creditors and consumers. He said the government was considering the OFT report, which recommended the introduction of an independent complaints body. John Hall, Scottish council member of industry body The Association of Business Recovery Professionals (R3), said they had previously offered to meet Mr Weir to discuss his concerns and "dispel any misconceptions". He said: "When a business enters into a form of insolvency proceedings, it does not have enough money to pay its debts in full. Sadly, it is therefore not possible for creditors to receive all the monies owed to them. "Insolvency practitioners are highly qualified and experienced professionals. They have an entitlement to be fairly paid."